Text: North Korea (key negotiator) Ms. Choe Hee-hee: "We Are Now Considering Stopping Negotiations with the US"
Sub point: Choi states: "It will soon be decided if Kim Jong Un will continue to maintain a nuclear or missile moratorium,"
"(SOS) Mike Pompeo and (NSC) John Bolton are the ones to have created hostility and mistrust." 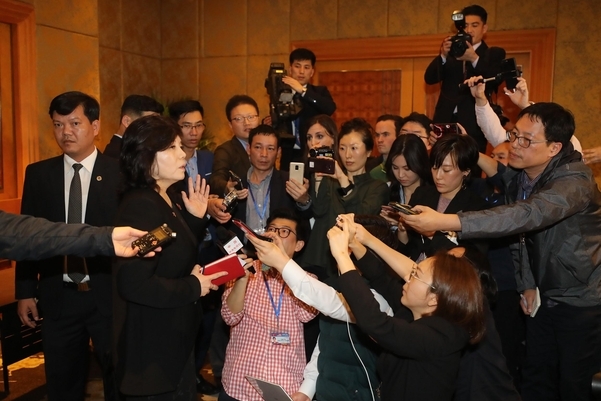 "It will soon be decided if Kim Jong Un will continue to maintain a nuclear or missile moratorium and the DPRK State Council leadership is now considering putting a halt to de-nuclearization talks with the United States"
"We have no intention of making any kind of concession to the demands of the United States," Choi said in a meeting with foreign diplomats and diplomats in Pyongyang on Friday, March 15. Choi said, "The United States last month issued a golden opportunity at the Hanoi summit between Kim Jong-un and President Donald Trump." North Korea has no intention of compromising or continuing dialogue unless the United States takes steps that correspond to North Korea's measures. We will change the calculation. " Choi added, "Kim Jong-un will soon announce an official statement on North Korea's future action plan after the second summit of North and South Korea in Hanoi." She put the blame squarely on two men serving the president. "President Trump was more willing to talk, but Secretary of State Pompeo and National Security Adviser Bolton made it clear that there was no more dialogue," Choi said. Note: Chosun Ilbo is one of three major Korean dailies in Seoul. It is the most conservative/anti-communist of the three. Ms. Choe is no bumbling idiot--I personally think she has it together for their side. She is a hothead. Having said that, she has been trained and educated intricately and is deeply familiar with the history and tactics of dealing with the Americans. From what I can see, Kim has not had any of his senior team executed or hauling cement and coal in the aftermath of Hanoi failure. He may be in a bind. For him to purge anyone, he risks losing some of his key players with knowledge and smarts. They will probably end up just picking out a lower-level few water boys and jockstrap carriers for symbolic punishment to be meted out. In their system, somebody has to pay for the screw up. NK, as fickle as Trump. Trump fickle? That’s funny right there. I'll take a wait and see attitude. (Unfortunately). Everyone says not to trust NK. Really?? Now how could that be. I think Kim is on a Merry-go-round....and doesn't know what the hell to do. He's in a lose lose situation. There have been indications of conflict between Kim Jong Un and some of his generals. Could some of these players have gained control of Kim? Good luck with that, I don’t think Trump was asking, he was telling. This is a #nevertrumper thread to give #nevertrumpers a high on bashing our President. I am sure they will feel better when Kamala Harris is running the show. If they’re unwilling to denuclearize, there’s nothing to negotiate. They either do, or they don’t. If they do, I trust our President to keep his word and do everything he can to bring them into the 21st century and become a prosperous nation. If they don’t, and step over the line, that will simply be the end of them. It’s amazing how many of them are still around, isn’t it? It makes you wonder how much happier they’d be with Jeb! or Mitt as President. This is Donaldus’ signal to get down on his knees and say “Pwease, pwetty pwease keep negotiating wiff me, widduw Kim. I’ll be your best fwiend! I need a photo op to win weewelection.” Wrong POTUS. Most “never-Trumpers” have stated that they would have preferred Hillary over Trump. They will be giddy over any Democrat who could be the next president. Unfortunately for them, they will have to endure Trump until 2024. Likely the intel was just too compelling, from the Dongchangri (test area), the Sohae launch site, Kangson research facility in Pyongan Province just north of Pyongyang by about 8 clicks, and the newest stuff to emerge about Sunan Airport missile activity. This information provided to POTUS, and at the urging of Pompeo and Bolton, he confronted DPRK with it and they lost it. Their tactical stance was they had so much wanted lengthy one-on-ones between the dictator and POTUS but were overruled. And thank God for that. They have every right to be pushed now and they will start the Temper Tantrum Mode again (as they have for 40 years) and until they once again get what they want. I believe they will be showing more stick and less carrot in the coming days. most criminals think they are smarter than everybody else. I put Kim in that category. The they here is the North Koreans of course.